Have your Kindergarten students begin practicing mental math with this quick, easy, and FREE “Problem of the Day” routine! 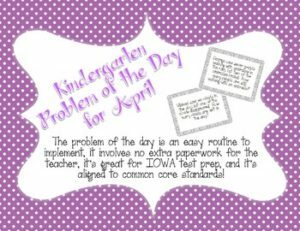 I ended up starting this routine as prep work for the story problems that are on the Kindergarten IOWA test… and my kids just love it! WHAT TOPIC(S) DO THE PROBLEMS FOR THIS MONTH FOCUS ON? This set, for April, focuses on subtraction stories. You can use this however will work best for you! For me, this is a quick five minute routine that we do every morning. Check out the blog post on the routine if you want to learn more about it! HOW MUCH PREP WORK DO I NEED TO DO? All you have to do is laminate, cut the page into four pieces, and go! That’s it! IS THIS JUST ANOTHER MATH JOURNAL? You could technically use these problems for math journals if you want, but this routine actually involves no paper and no pencils! If your students take the IOWA test, you know that the test doesn’t allow for students to use scrap paper to solve their math problems, so I use my problem of the day to focus on counting with our fingers and beginning to practice mental math! WHAT TOPICS DO THE OTHER MONTHS HELP TEACH/REINFORCE? CAN I BUY ALL OF THE MONTHS TOGETHER?